Earth’s inner core is by far the most remote region of the planet and exists at conditions of over 3.6 million atmospheres (360 GPa) pressure and temperatures perhaps in the 6000 K range. While remote, its existence affects the geodynamo and how the Earth’s interior has evolved through time. A number of enigmatic properties of the Earth’s inner core have been recently discovered, including variable seismic speeds in the inner core and differential super-rotation in which Earth’s inner core is observed to be rotating at a different speed from the rest of the planet. Deciphering these observations requires a knowledge of the composition of the Earth’s inner core and the sound velocities and densities of candidate iron alloys at high pressures and temperatures. A team of CDAC scientists has measured the compressional-wave velocity and density of iron and iron-silicon alloy at pressures over a megabar and at high temperatures to understand the physical and chemical properties of the core. The group consisted of CDAC partner Jung-Fu Lin, CDAC student Jeff Liu, and former CDAC student Zhu Mao (Princeton, now a postdoctoral associate at UT Austin), CDAC Associate Director Ho-kwang Mao (Carnegie), and colleagues at the Advanced Photon Source. The experiments were carried out using the diamond anvil cell and advanced inelastic x-ray scattering and x-ray diffraction techniques. 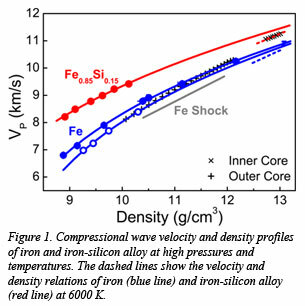 Results from these measurements show that high temperature significantly decreases the compressional-wave velocity of iron in the hexagonal close packed structure at high pressures, and the iron-silicon alloy exhibits similar high-pressure behavior to pure iron with a constant density offset. Together with the published results, the group has created a new velocity-density model of iron alloys to constrain the chemical composition using seismic observations of the Earth’s core. Indications are that Earth’s inner core, with approximately 8 wt% silicon can have a velocity-density profile at 6000 K that matches well with seismic observations in the region (Fig. 1). [Z. Mao et al., Proc. Nat. Acad. Sci. doi:10.1073/pnas.1207086109 (2012)].